The Sci-Fi flicks have gone on vacation this weekend to make room for Action and Fantasy. 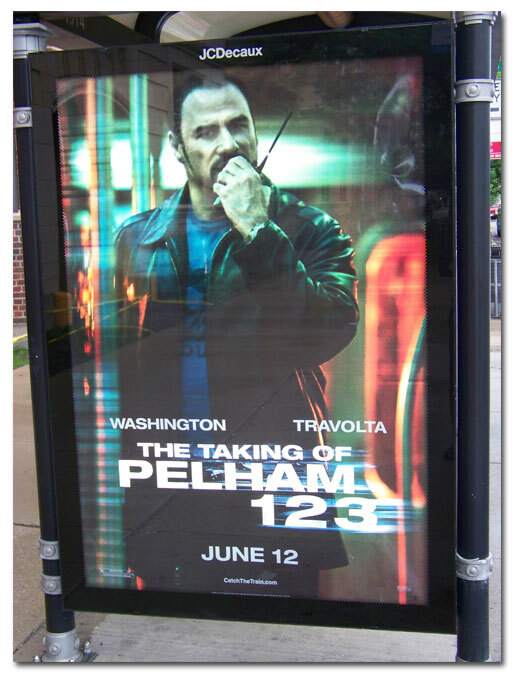 The big box office winner is sure to be The Taking of Pelham 1 2 3, a slam-bang special effects-filled remake, starring Denzel Washington and John Travolta, two of Hollywood’s most bankable actors. The other major opener is Eddie Murphy‘s latest family money bag Imagine That. It, of course, got terrible reviews, but to be fair, not as terrible as his last effort. This Drop Dead Fred rip-off centers around an up-to-his-neck-in-work dad whose life gets transformed by his daughter’s imaginary friends. Most critics agree that the movie’s other star, young newcomer Yara Shahidi, gives an inspired performance, but that it’s not enough to dish out ten bucks for. They also note how tired this “busy father learns to connect with his kids by finding his own inner child” genre is. It certainly has been done to death. And those kind of movies usually end with the dad throwing his cell phone/blackberry/pager into the water or trash can to signify his newly energized devotion to his family (see Hook). To sum things up, I’ll give the floor to Owen Gleiberman of Entertainment Weekly: “Imagine That is a benignly didactic kiddie movie that at once benefits from and gets buried under Eddie Murphy’s skittery, overeager inflections.” The poor guy. Remember when he used to be cool? The other movies opening this weekend are Moon, an indie thriller that’s appropriately titled considering that director Duncan Jones’ father is the “Space Oddity” himself David Bowie; the well-reviewed doc Youssou Ndour: I Bring What I Love, about a Senegalese pop star; and Francis Ford Coppola‘s mediocre biopic Tetro, starring a fully clothed Vincent Gallo (thank God!). It’s nice to see that Coppola is still working, but when is he going to direct a film as good as The Godfather again? Or even Peggy Sue Got Married? The End of a Fuzzy Television Era ‘Wait, Wait…Don’t Tell Me’, It’s June? !